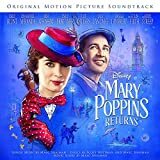 The place where lost things go – Paroles de la chanson dans “Le retour de Mary Poppins”. The place where lost things go. Do you ever lie awake at night. Just between the dark and the morning light. Searching for the things you used to know. Looking for the place where the lost things go. Do you ever dream or reminisce. Wondering where to find what you truly miss. Maybe all those things that you love so. Are waiting in the place where the lost things go. Memories you’ve shared, gone for good, you feared. They’re all around you still, though they’ve disappeared. Nothing’s really left or lost without a trace. So maybe now the dish and my best spoon. Are playing hide and seek just behind the moon. Waiting there until it’s time to show. Spring is like that now, far beneath the snow. Hiding in the place where the lost things go. Time to close your eyes, so sleep can come around. For when you dream you’ll find all that’s lost is found. Maybe on the moon, or maybe somewhere new. Maybe all you’re missing lives inside of you. So when you need her touch and loving gaze. Gone but not forgotten is the perfect phrase. Smiling from a star that she makes glow. Trust she’s always there, watching as you grow. The place where lost things go (reprise). Interprétée par Joel Dawson, Nathanael Saleh et Pixie Davies.